Soul Purpose is a quartet that can thrill you with their upbeat style or will move you with an inspirational message. When Greg Rosevold (tenor), Arv Zenk (lead), Byron Norell (baritone), and Sandy Allen (bass) met as a quartet for the first time it was kind of a “blind date” set up by another member of the Riverblenders chorus. 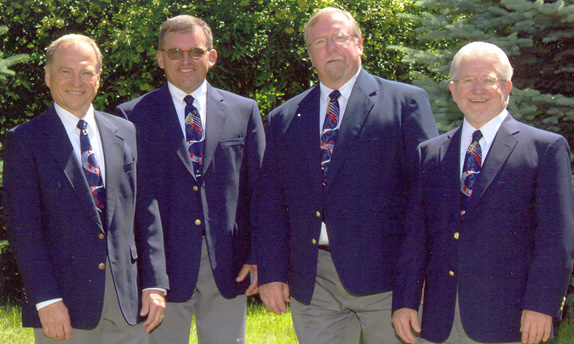 The quartet discovered that although they had a number of collective years singing barbershop harmony not a single member had ever been in a formally organized barbershop quartet. Once they struck their first chord they discovered a dynamic sound that is truly unique to Soul Purpose. They also discovered that they shared a mutual love for a variety of music – from traditional barbershop to gospel music – they love it all. Enjoy Soul Purpose – “Spirited Entertainment – Barbershop Style”.